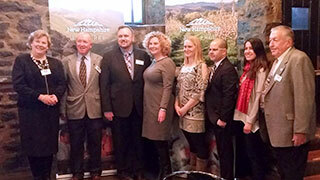 Left to right, Martha Sullivan, Portsmouth Chamber of Commerce; Mike Blair, Lakes Region Tourism Association; Sean Ryan, Greater Peterborough Chamber of Commerce; Victoria Cimino, Visit New Hampshire; Katelyn White, New Hampshire’s Grand North; Kosta Tsimiklis, CWW Worldwide; Michele Kota, Visit New Hampshire; Mikey Duprey, White Mountains Attractions Association. Quebeckers constitute 60% of the million-plus Canadians visiting New Hampshire every year, so it’s hardly surprising that a delegation of the state’s tourism partners feted Montreal-area travel trade Friday over lunch at historic Auberge Saint Gabriel. From quaint New England villages to sophisticated culinary offerings, from Atlantic Ocean shoreline to the tallest mountain east of the Mississippi River, the White Mountain state has something for everyone, said state tourism head Victoria Cimino. She was joined in the briefing by Kosta Tsimiklis of CWW Worldwide, the state’s Canadian marketing agency. “We’re best known for outdoor recreation,” Cimino added, pointing to skiing, hiking, fishing, rafting, dogsledding – and motorbiking. Tens of thousands descend each June on the Laconia Motorcycle Week, the oldest bike rally in North America. But it’s tax-free shopping and outlet malls that attract a good part of the Canadian market, Cimino added. “It’s huge for us. I can’t express that enough.” And her state hopes to expand that market when Air Canada introduces seasonal Vancouver-Boston service 23JUN. With the shortest seacoast of any U.S. state – just 13 miles– New Hampshire ensures the waterfront is publicly accessible. Wolfeboro became the first summer resort in America, dating to 1771. The town is named after James Wolfe, who defeated the French on Quebec City’s Plains of Abraham. The longest alpine zipline in North America can be found at Attikash Mountain Resort in the White Mountains region. Portsmouth is one of the 10 most romantic towns in the U.S., according to Travel and Leisure magazine, and it anchors a newly designated Seacoast craft beer trail with 17 stops. Mount Monadnock in southern New Hampshire is the world’s second most-climbed mountain, while the nearby MacDowell art colony is the oldest such retreat in the country. Thornton Wilder, Aaron Copeland and Alice Walker all produced some of their finest work while in residence there. And, not to be overlooked, Jimmy Fallon named his daughter Winnie after Lake Winnipesaukee, where he and his wife vacation and were engaged. The lake is the largest in New England. Peter Johansen is an Ottawa-based writer and retired professor from the Carleton School of Journalism.